Since 1991, The Pilates Center, Boulder, has offered one of the first, and most in-depth, comprehensive, classical Pilates Teacher Training Programs available! Originally designed with Romana Kryzanowska, it’s now available online worldwide. Located in the center of West Hollywood, Cotrone Pilates is a classical Pilates studio that caters to the individual’s needs. We offer private one on one sessions on Gratz equipment, and offer a 9 month certification program that covers the whole system. Sam and Susannah are both classically trained ballet dancers who opened Cotrone Pilates to create an environment that embraces the classical Pilates method of teaching, while maintaining a friendly and fun atmosphere and we are dedicated to helping you achieve your personal fitness goals. Whether you have never tried Pilates before, or are ready to get back to practicing we welcome you! PilatesBridge offers website development services for Pilates studios and individual instructors. All work is done by Anastasiya Goers, a Pilates instructor and website developer with 10+ years of experience. Anastasiya speaks “Pilates” and will guide you every step of the way from creating a design that represents your unique style to launching an online marketing campaign to make your Pilates business flourish. PilatesBridge offers website creation, redesign, maintenance as well as search engine optimization (SEO.) Whether you need a simple website for a studio, need to improve your rankings in search engines or would like to add a new revenue stream through online video streaming services or eCommerce integration, PilatesBridge will help you build the “core” of your online presence. GoingMoreJoe.com is developed and maintained on the web by Anastasiya Goers. Hi, my name is Elena Bartley, founder of TuPilates.video. I have been studying Pilates for over 30 years, traveling the world, and meeting others who have the same passion for the craft. We owe it all to Joseph Pilates and yet, we’ve never practiced on his original designs. I’d like to introduce you to Joes Original Home Mat! Hand crafted to order, we took meticulous care in recreating the Master’s original design into a perfect replica. Now is your chance to practice how Joe intended us to practice! With 2 soft yet firm folding mats, it is the perfect surface to exercise your back and abdominals correctly. True to the original design, this mat includes two removable and adjustable dowels for all your exercise needs. Perfect for any body shape. Storage is a breeze!, all you do is fold and put away, it’s that simple! TRADITIONAL PILATES EQUIPMENT new meets the old! Elisabet and Fredrik Prag, with over 50 years of combined pilates experience between them both. They also have pilates studio in Malmö. Why is Pilates Scandinavia by Prag Movement unique? The research put into each material and detail was extensive to ensure the combination of the pieces flow perfectly. Just like pilates is about connecting the body, each piece of the equipment plays a part in the larger role of the apparatus. Elisabet likens it to playing an instrument: “There’s a sensitivity to feel the difference in different equipment, so as a manufacturer you need to be able to feel all those vibrations and tones so the notes and overall music resonate into your body creating the right tune. When everything is connected the body reacts deeper, and our aim is for our clients to create the most effective workout using our equipment. Materials and Production? Everything is produced in Sweden except for the wheels, which are made in the US from the only company in the world that produce wheels up to their standards. The springs are made at a local Swedish steel plant. The leather is sourced from a local Swedish supplier. The wood is ash. The apparatus themselves are constructed by a local Swedish manufacturer. 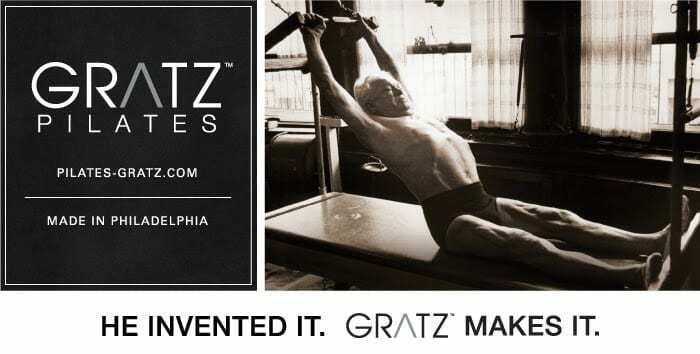 Gratz Industries is the original manufacturer of Pilates apparatus and the industry’s established source for authentic equipment. Our company was started by Frank Gratz in New York City in 1928 as a custom fabrication shop producing industrial design prototypes, architectural metal, furniture and sculpture for many of the world’s greatest designers. This legacy of high end fabrication and tradition continued with Frank’s son Donald Gratz who applied his engineering and metalworking expertise working closely with Romana Kryzanowska in the late 1960’s. This collaboration with Romana resulted in the preservation of the dimensions and proportions critical to the correct functions of the Pilates apparatus. Thanks to this relationship Gratz maintained a fidelity to Joseph Pilates original vision by fabricating apparatus with unerring craftsmanship and exacting specifications which continues today.